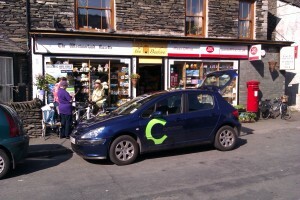 Staveley Car Club, established with support from SENS and run by Social Enterprise Co-wheels, operates in the village, along with cars in several other locations in the Lakes. The cars are available to use on a pay-as-you-drive basis. Members can book the cars (internet, phone) for as little as half an hour – walk up, unlock with a smart card, drive, return, walk away – and get a bill at the end of the month. Car club cars are popular to replace occasionally used cars. Car sharing your journey to work or your weekly shopping trip is a great way to save money and help others to do so too. If you are interested in car sharing, or are happy to offer someone else in the village a lift, why not put a note on the village noticeboard. Rural Wheels is a unique transport scheme for people in rural areas. The service provides transport that will collect you from home and take you to your nearest town or the nearest public transport service. Rural Wheels uses a ‘Smartcard’ to pay for travel and a central booking system to plan journeys. Passengers need to apply for the Smartcard before they are able to use the scheme. The Smartcard is used instead of handing over cash to the transport providers and the ‘value’ of the card can be topped up at local post offices, libraries, mobile libraries, and by the driver. Travel under the scheme needs to be booked 48 hours in advance by telephone so as to allow the most cost-effective use of the transport resources available. Users may be asked to share transport. Another way in which public transport problems in rural areas can be overcome is through Community Minibus sharing schemes. These schemes enable groups and organisations within the community to have accessible and affordable vehicles, which can be either on a self-drive basis or with a driver supplied. The scheme is not open to groups or organisations of a commercial or profit-making nature, nor is it open to members of the general public acting outside of the criteria above. If you are part of a local community group that has a transport need, please contact Cumbria Community Transport on 01539 727001 for more information. For local journeys please call Community Transport South Lakeland on 01539 742637 who will make every endeavour to meet your request. There is a small mileage charge to cover the volunteer driver’s running costs. Volunteer drivers are always needed – if you could spare some time to help the people in your community who need transport please call the above number. There are over 40 Voluntary Car Schemes in Cumbria. If you would like further information please call the Passenger Transport Development Officer at Cumbria County Council on 01228 226721. People who regularly car share can save up to £1,000 per year.